Although a middleweight or lighter by modern standards, Tom Sayers fought in the first great international heavyweight championship match against American John C. Heenan. Sayers, who never topped 152 pounds, routinely took on opponents of all sizes. 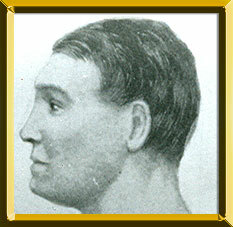 In 1849, Sayers defeated Abe Couch in his first professional fight. His next fight was broken up by the police after nine rounds, then later reconvened to end in a 39-round draw when darkness fell. In 1853, Sayers met the acknowledged middleweight champion, Nat Langham. By the 61st round, Sayers’s eyes had swollen shut and his seconds threw in the towel. After an impressive victory over Harry Poulson, Sayers fought a tough draw with Aaron Jones and whipped him soundly in the rematch. Sayers then met Bill Perry, who at that time called himself the heavyweight champion. Perry outweighed Sayers by 50 pounds and won the early rounds of the match, but in the tenth, Sayers split Perry’s lip and his seconds called an end to the fight. Although his evasive tactics led some to accuse Sayers of cowardice, he had fought a very smart fight that won him the heavyweight championship. Sayers mounted four successful defenses before facing Heenan, a claimant to the American heavyweight title. For the first time, a match in Eng-land aroused interest on both sides of the Atlantic, and was well-reported in the newspapers. Heenan outweighed Sayers by 46 pounds and towered six inches above him. The fight was bloody from the beginning, and in the sixth round, Sayers broke his right arm blocking a punch. In the eighth, Heenan broke his left hand. Sayers then targeted Heenan’s eyes, and although the American dominated the fight, he was rapidly becoming blinded. In the 37th, Heenan held Sayers helpless against the ropes, which someone suddenly cut. The crowd surged inside the ring and the referee deserted, but the two bloody battlers continued for five rounds until the match ended in a draw. The courage of both competitors was much admired, and boxing interest in the U.S. soared. Sayers retired after the fight and died of tuberculosis and diabetes six years later.